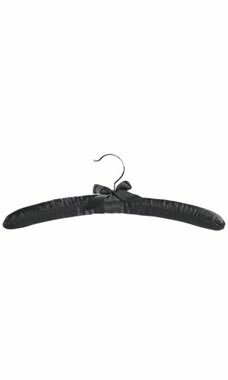 Delicately wrapped in a billowy, foam padding and covered by luxurious black satin, these hangers will instantly set the mood in your showroom. Ideal for hanging lingerie, these satin hangers will keep your garments in tact. The soft surface of the fabric prevents snagging on the most fragile apparel. These lingerie hangers features a little ribbon bow at the neck of the silver metal hook to add a touch of femininity to the hanger. Our wholesale lingerie hangers are sold in cases of 25.